FEATURES & OPTIONS: Full-color / full-bleed, double-sided printing. Die-cut hole and slit that come ready to use. Optional perforation available. Want to make sure your target audience gets your message? Put it right in front of them through a door hanger. Door hangers allow you to place your message where you know it will be seen. 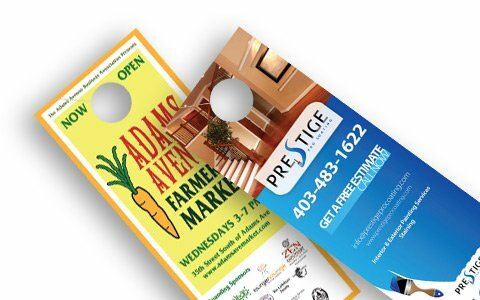 Whether you’re campaigning for office, advertising a lawn care special or promoting a grand opening, you’ll find the door hanger to be an effective, affordable form of advertising.